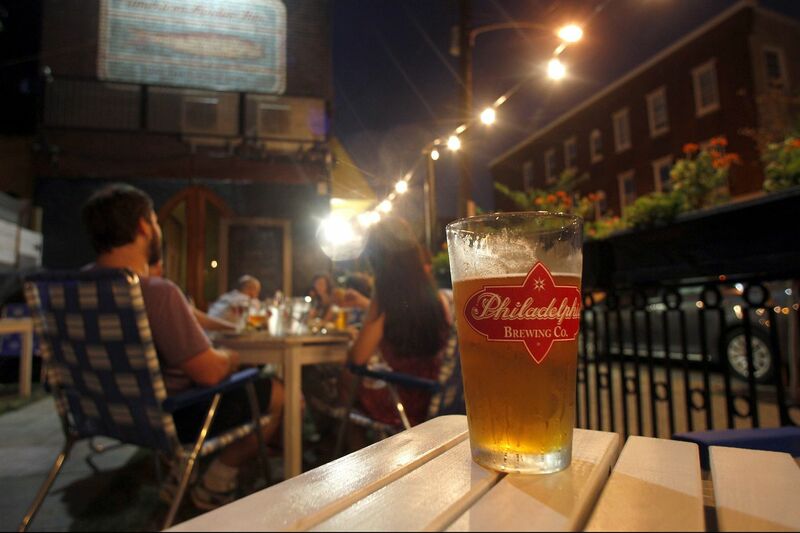 The American Sardine Bar beer Garden in the Point Breeze section of Philadelphia is a great place for an al fresco meal. Question: I saw your recent review of Harper's Garden. Where else should I go for al fresco dining in Philly? Craig LaBan: First off, thanks for reading! I found Harper's Garden (31 S. 18th St.) intriguing — an ambitious step up from the usual beer garden with sophisticated small plates, craft cocktails, and a beautiful trellis veranda lush with herbs, vines, and lights. A server wipes off a table after rain in preparation for a busy night at Talula’s Garden in Philadelphia. It's set back enough from 18th Street to feel like a true oasis and has brought welcome new life to a long-dead plaza in front of an office building. In many ways, the design and placement remind me of Talula's Garden (210 W. Washington Square) off Washington Square, which Harper's co-owner Avram Hornik acknowledges was an inspiration. Talula's has more of a fine-dining vibe than Harper's but is always reliable for some inspired seasonal cooking and, of course, the city's best cheese platters. It's fascinating to see how ubiquitous outdoor dining has become here since Rouge broke the barrier in 1998 and became Philly's first to offer sidewalk seating. That legacy is, of course, evident at Rouge and Parc. But I'd head just a half-block north to quieter a.kitchen (135 S. 18th St.), where one of the city's best wine programs is paired with French-inspired seasonal cooking from Eli Collins. The closure of Le Cheri and its secret garden behind the Art Alliance is a big loss. But the recently reopened Branzino (261 S. 17th St.), which had a major revamp after a fire, has one of the city's most impressive back-garden areas. Good outdoor dining, though, is hardly limited to Rittenhouse Square. Head directly south on 18th Street to Point Breeze, where American Sardine Bar (1800 Federal St.) has one of my favorite backyard gardens for craft beers and a fun gastropub menu focused on creative sandwiches, my favorite onion rings, and, sometimes, crispy Sichuan-flavored chicken wings that are addictive. On East Passyunk Avenue, Le Virtù (1927 E. Passyunk Ave.) has a gracious front patio with muraled walls that are as evocative of Abruzzo as the rustic menu. The pointy sidewalk terrace trimmed with topiaries at Barcelona Wine Bar (1709 E. Passyunk Ave.) is a lively destination for traditional tapas, platters of hand-sliced Mangalica ham, and Spanish wine. Maison 208’s upstairs bar and lounge area with a retractable roof. Midtown Village is full of charmingly hidden outdoor eating spaces, like the courtyard behind Little Nonna's (1234 Locust St.) for stuffed meatballs and Japanese eggplant Parmesan, Graffiti Bar (124 S. 13th St.) for pan-Asian street food, the sushi courtyard at 1225 Raw (1225 Sansom St.), and Maison 208 (208 S. 13th St.) for grilled Haitian pork skewers, black truffle pizzas, and natural wines in its open-air upstairs lounge. In Old City, Royal Boucherie (52 S. Second St.) has one of Philly's best-kept al fresco secrets in the outdoor alcove tucked onto its second floor. Spruce Street Harbor Park is an obvious choice for casual food-truck fare in a hammock. But La Peg (140 N. Christopher Columbus Blvd.) is the best option for a sit-down meal near the Race Street Pier, with a shaded beer garden with a river view and updated American classics (the "fast-food burger"; a lobster roll). Farther north in Fishtown, there's also plenty of breezy dining. A new courtyard has popped up between Cheu Fishtown (1416 Frankford Ave.) and its coming project, Nunu, a Japanese izakaya. The chef situation was in transition the last time I ate at Kensington Quarters (1310 Frankford Ave.) in the spring. But I still had a fantastic meal, and one of the best rib eye steaks in the city — and its sprawling backyard dining space is grand. The grandest outdoor dining space of all, though, is still in the works behind Fishtown's Lebanese palace, Suraya, where the intricate tile work, floating fire, and fountains are on pace to be finished before a scheduled mid-August wedding. "It's going to be close!" co-owner Roland Kassis told me. At least that means we'll have something new to look forward to for al fresco dining in the fall.